A NEAR tragic incident on the hard court almost spoiled the 14th Loyola Cup collegiate division championship match between defending champion Southern Philippines College (SPC) and Philippine Countryville College of Maramag when high-leaping guard Ronie Salido of the Bukidnon team crashed to the floor - head first. 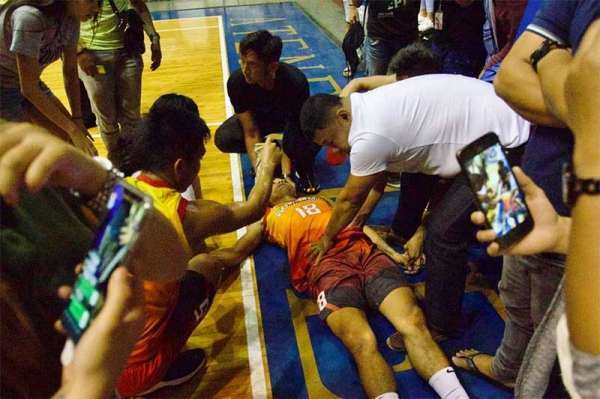 The 5-foot-8 Salidio, a former high school player of SPC coach Rey Dangcal, crashed to the parquet flooring of Xavier University gym in Cagayan de Oro City during a rebound scuffle off a miss from a driving SPC player with still six minutes and 22 seconds more to go before the end of the second quarter. Salido fell on the back of SPC shooter Joel Go first and to the floor, hitting the right side of his head and injuring his right ear. Commotion then erupted when Salido winced in pain on the floor as PCC Marvie Maribao charged on Go and threw a punch. PCC coach Joseph Lantong, however, pulled Maribao while cooler heads intervened as everyone turned their attention to Salido who also hit the floor. Coach Lantong and the PCC coaching staff tried to revive Salido for several seconds. Luckily, he woke up and was laid on the floor instead of sitting up to avoid any further injuries while waiting for an ambulance to arrive. 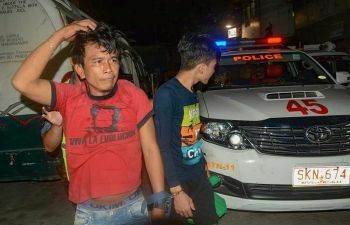 After a few minutes, the Cagayan de Oro City Hospital ambulance arrived and brought Salido to the CdO City J. Borja Hospital in Barangay Carmen for admission. According to the officials of PCC, Salido was in stable condition that he can already stand on his feet. He was waiting for CT scan to check if he had suffered any brain injury. Salido checked out of the hospital at 1 a.m. Friday, according to tournament commissioner Arvin Martinez. It was a sorry loss for the Stags as they led from the first quarter up to the third quarter until they collapsed with still five minutes left for SPC to retain the title, 58-50. “The loss of Salido and the ejection of Maribao were crucial. They were my key players,” said Lantong, who was also critical on the bad calls of the referees during the entire match. Go was also ejected from the match for unsportsmanlike behavior that caused the fall of Salido. African Stephenne Kazambe, a top point maker and rebounder for PCC all throughout the tournament, was limited to only nine points as he lost his concentration after the incident. “Courage Ronie Salido, you are a warrior. I could not play well right after your fall. I totally lost concentration but thank God you are safe and sound and I hope you come back soon,” said Kazambe in his Facebook post. Coach Rey Dangcal, on his part, said that he felt bad on what happened to his former ward Salido. Coach Dangcal had Salido among his charges during his short stint with the Cagayan de Oro College Phinma. “But I am sure my player did not mean to hurt him. I really hope Ronnie is ok,” he said. The Sharks and the Stags exchanged fire at the start of the fourth quarter after Windelo Sillar’s two-pointer put the Stags ahead by two, 39-37 at the end of the third quarter. Rudjud Daga and Christian Pagaran took turns for the Sharks attack while Dennis Barbon, Jelord Monteza, Donald Abadilla and Kazembe responded for the Stags to take back the lead for the last time at 50-48. But It was the Stags’ last hurrah as point guard Kobe Canoy unleashed an 8-0 run for the SPC Sharks’ final breakthrough. Canoy’s offensive thrusts included two 3-point bombs and a perimeter shot. 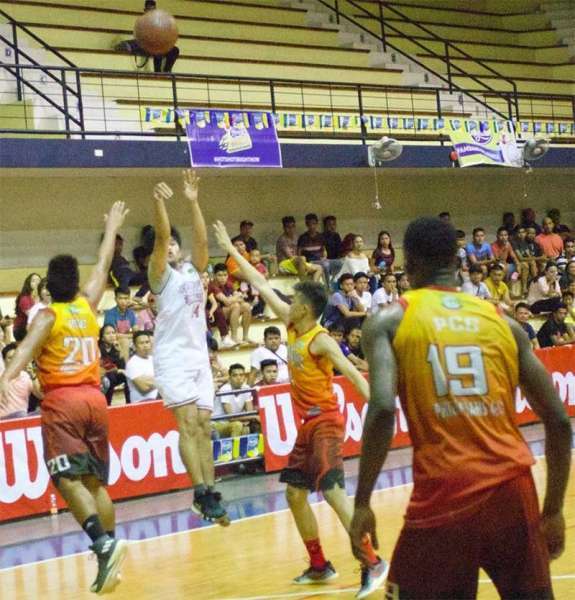 Earl Ibot’s three- point play completed the SPC’s 3-peat, while spoiling Stags’ party in the Loyola Cup hoopfest. “Right from the start, PCC’s defense was really good. We could not break their zone defense that is why during halftime, I told my players about our defensive adjustments to pressure the ball and deny Kazembe the ball and focus more on defense. The players responded and our defense really helped us win the trophy,” Dangcal said. Canoy led the Mythical five selection with Pagaran, Mark Chris Bancal of Iligan Medical Center College (IMCC), Luarence Tindoy of XU and Kazembe. Pagaran who was named MVP top-scored SPC with 15 points as Daga and Ibot contributed 13 and 10 points each. Dennis Barbon paced PCC with 15. In the battle for third place, Xavier University Crusaders squandered a nine-point third quarter lead, 43-34 to yield to Iligan Medical Center College (IMCC) Rhinos, 75-78. Bull-strong center Dario Piatti played his best game in the tournament, scoring 21 points but it was not enough to stop the Rhinos who leaned on their endgame brilliance to secure the third place honor. Trophies and medals were awarded by Kryzza Allen “Coach Kam” Casiño, a former UAAP player of the UP Fighting Maroons and currently the Chairperson of XU Senior High School PE Department. Casiño is also head coach of XU Women’s basketball team and Deputy Commissioner of the 14th Loyola Cup and CdO NBTC League. SPC (58) -- Pagaran 15, Daga 13, Ibot 10, Canoy 8, Tamparong 7, Alvarez 4, Tanawon 1 PCC (50) Barbon 15, Abadilla 9, Kazembe 9, Maribao 7 Salido 4, Lantong 2, Silar 2, Monteza 2 . Quarter Scores: 8-13; 21-24; 37-39; 58-50.